Hello! I am so happy you are visiting my blog, Baked in Arizona (Baked in AZ for short). To sum up my blog real quick I would say I share a variety of recipes. Delicious dinners to indulgent desserts. And a little bit in between. I love ALL food. I love green smoothies and a warm brownie. 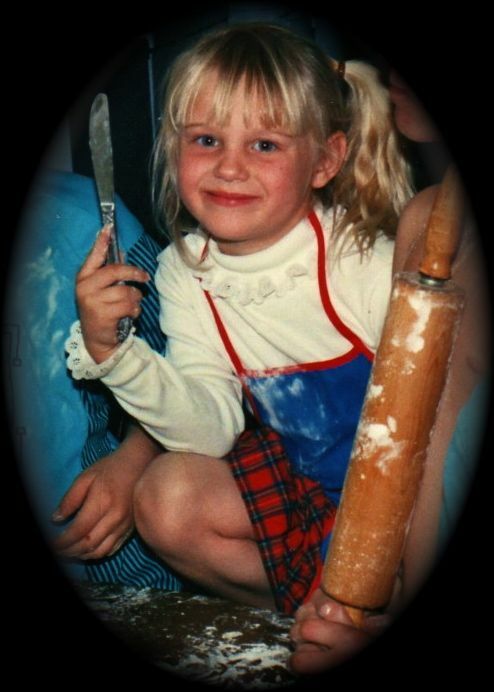 I’ve always loved being in the kitchen, especially baking! And I love sharing my favorite recipes with family and friends. Making a batch of cookies is my kind of therapy. Some people say the same thing about going for a run. Sure doesn’t taste as good though. :)I blog because I want to share recipes my family has enjoyed in hopes that you will enjoy them too. I hope that you will look around my blog and find a recipe that speaks to you. Something that makes you want to go right into your kitchen and get baking! The kitchen is a great place to make memories with your family. Turn on some music, dance around, enjoy the process. Some nights, with kids crying and a sink full of dishes, it’s not the most enjoyable thing but I do try to keep things up beat or lets be honest, I might go crazy :)I share lots of desserts but I also share healthy recipes too! I believe in moderation. I try to exercise and eat lots of fruit and vegetables everyday so when I indulge in a tasty treat (like every night! ah!) I don’t feel so guilty about it. Life is short, eat cookies is my motto. Some of my hobbies that I enjoy (other than making food for my family) are: running, cleaning, reading, hiking and snowboarding (although being so far away from the snow, I don’t get to do that as much as I would like to). 1. I think every movie should end with a wedding. 2. I have loved chocolate since I was tiny and my mother says I could sniff her stash out anywhere. 3. I prefer milk chocolate but also love white chocolate. If a recipe has white chocolate in it, I instantly like it even more and wanna try it. 4. I always wanted to be a mom and would dream about what I would name my children. Which is funny cause I didn’t name any of my kids the names I had picked out. We actually had a really hard time naming my 2nd son. We couldn’t leave the hospital because we couldn’t decide. 6. I used to love to play in the kitchen when I was young and act like I had my own cooking show. 7. I have 4 brothers and 1 sister. I used to be a big tomboy and thought I wanted to be a boy. 8. I went to interior design school (in Fountain Hills, AZ) before I got married. 9. I love country music. I don’t care what people say about it being sad. I just love it. 10. My current favorite T.V. shows are: Downton Abby, Nashville, Fixer Upper & Suits. Throwback to the 80’s! I believe I was making a delicious pumpkin pie in this photo. And here are my biggest supporters and my favorite people in the world. They are my everything. Thanks for visiting my blog. I hope you find something that will make your family happy and your house smell divine!